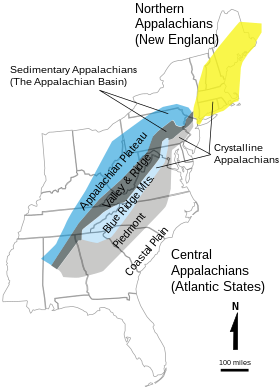 The Appalachian Mountains [a], often called the Appalachians, are a system of mountains in eastern North America. 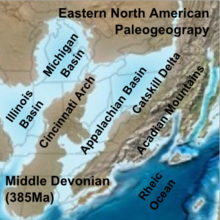 The Appalachians first formed roughly 480 million years ago during the Ordovician Period. They once reached elevations similar to those of the Alps and the Rocky Mountains before experiencing natural erosion. 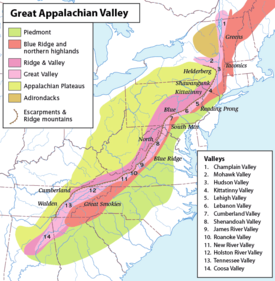 The Appalachian chain is a barrier to east–west travel, as it forms a series of alternating ridgelines and valleys oriented in opposition to most highways and railroads running east–west. The mountain range is mostly in the United States (U.S.) but it extends into southeastern Canada, forming a zone from 100 to 300 mi (160 to 480 km) wide, running from the island of Newfoundland 1,500 mi (2,400 km) southwestward to Central Alabama in the United States. [ discuss] The range covers parts of the islands of Saint Pierre and Miquelon, which comprise an overseas territory of France. The system is divided into a series of ranges, with the individual mountains averaging around 3,000 ft (910 m). The highest of the group is Mount Mitchell in North Carolina at 6,684 feet (2,037 m), which is the highest point in the United States east of the Mississippi River. In Pennsylvania, there are over sixty summits that rise over 2,500 ft (800 m); the summits of Mount Davis and Blue Knob rise over 3,000 ft (900 m). In Maryland, Eagle Rock and Dans Mountain are conspicuous points reaching 3,162 ft (964 m) and 2,882 ft (878 m) respectively. On the same side of the Great Valley, south of the Potomac, are the Pinnacle 3,007 feet (917 m) and Pidgeon Roost 3,400 ft (1,000 m). In West Virginia, more than 150 peaks rise above 4,000 ft (1,200 m), including Spruce Knob 4,863 ft (1,482 m), the highest point in the Allegheny Mountains. A number of other points in the state rise above 4,800 ft (1,500 m). Cheat Mountain( Snowshoe Mountain) at Thorny Flat 4,848 ft (1,478 m) and Bald Knob 4,842 ft (1,476 m) are among the more notable peaks in West Virginia. In the northern section the height of land lies on the inland side of the mountainous belt, and thus the main lines of drainage run from north to south, exemplified by the Hudson River. However, the valley through which the Hudson River flows was cut by the gigantic glaciers of the Ice Ages—the same glaciers that deposited their terminal moraines in southern New York and formed the east-west Long Island. By the end of the Mesozoic Era, the Appalachian Mountains had been eroded to an almost flat plain. 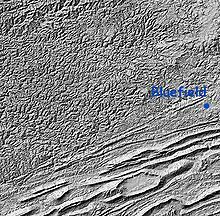 It was not until the region was uplifted during the Cenozoic Era that the distinctive topography of the present formed. Uplift rejuvenated the streams, which rapidly responded by cutting downward into the ancient bedrock. Some streams flowed along weak layers that define the folds and faults created many millions of years earlier. Other streams downcut so rapidly that they cut right across the resistant folded rocks of the mountain core, carving canyons across rock layers and geologic structures. The 1859 discovery of commercial quantities of petroleum in the Appalachian Mountains of western Pennsylvania started the modern United States petroleum industry. Recent discoveries of commercial natural gas deposits in the Marcellus Shale formation and Utica Shale formations have once again focused oil industry attention on the Appalachian Basin. 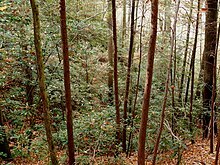 Characteristic birds of the forest are wild turkey (Meleagris gallopavo silvestris), ruffed grouse (Bonasa umbellus), mourning dove (Zenaida macroura), common raven (Corvus corax), wood duck (Aix sponsa), great horned owl (Bubo virginianus), barred owl (Strix varia), screech owl (Megascops asio), red-tailed hawk (Buteo jamaicensis), red-shouldered hawk (Buteo lineatus), and northern goshawk (Accipiter gentilis), as well as a great variety of "songbirds" ( Passeriformes), like the warblers in particular. ^ Poag, C. Wylie; Sevon, William D. (September 1989). "A record of Appalachian denudation in postrift Mesozoic and Cenozoic sedimentary deposits of the U.S. Middle Atlantic continental margin". Geomorphology. 2 (1–3): 119–157. doi: 10.1016/0169-555X(89)90009-3. ^ Palmer, M. A.; Bernhardt, E. S.; Schlesinger, W. H.; Eshleman, K. N.; Foufoula-Georgiou, E.; Hendryx, M. S.; Lemly, A. D.; Likens, G. E.; Loucks, O. L.; Power, M. E.; White, P. S.; Wilcock, P. R. (January 8, 2010). "Mountaintop Mining Consequences". Science. 327 (5962): 148–149. doi: 10.1126/science.1180543. ISSN 1095-9203. PMID 20056876.